The mystery of controlling a Great Dane puppy? That’s easy. Buy a flat-link choke chain. 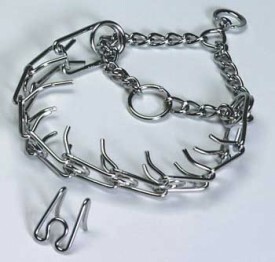 But don’t mistake a flat-link choke collar for a prong collar. Prong collars are particularly evil-looking things that a Renaissance-era vet with a twisted sense of humor probably borrowed from the peaceful history of the Spanish Inquisition. Wanted: Dog looking for trouble seeks same. Friendship and mischief only. Think back to when you were a teenager looking for trouble during summer vacation. You never did? Okay, think of a cousin who fits this description. Every family tree has at least one. (Even Marty McFly’s fictional family in Back to the Future included the imprisoned Uncle Joey in the narrative). If your puppy’s channeling Uncle Joey and currently goofing off, or thinking of some kind of goofing-off escapade in the near future, they need oxygen to make it happen. A choke collar restricts oxygen flow. It really works. The first time it tightens around your dog’s neck, you’ll have his or her attention. Dog advocates closely aligned with PETA might think of choke collars as waterboarding without the water. They’re not. In the two months since we picked up a chain at the Woofstock Dog Show in scenic Vallejo, CA, our ability to control and mitigate impulsive behavior has greatly increased. Luna’s a large adolescent (close to 90 lb) with a fair degree of wilfulness but the chain negates her biggest asset—physical strength. This is even more of an issue if you have male Great Dane puppies. They’re obviously much bigger and stronger than female puppies. And, if you’re like MW, a human female under 130 lbs who’s never taken Dianabol or done a single Crossfit class, a dog’s physical strength is a big issue to overcome. Choke collars are the big equalizer. You slip it on. Make sure it rides high on the dog’s neck close to her jaw. When you need to correct behavior, a light snap on the leash, plus whatever verbal commands you use should suffice. That’s it. It certainly has worked with Luna. 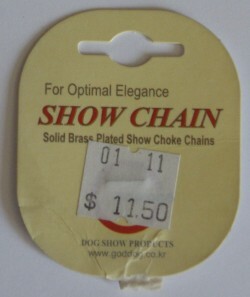 Flat-link choke collars come in different lengths and thicknesses and colors. (Don’t get the gold color, though, as it fades and/or chips with time, according to the guy who sold us Luna’s collar). They’re also pretty cheap – Luna’s cost $11.50. Okay, $11.50 is hugely expensive for what is a 20″ chain with two small rings attached to the ends. I’m talking “price” in terms of the end result or big picture–a better behaved dog. In this context, $11.50 is cheap if it contributes to raising an obedient dog. In the next post, you’ll learn how to select the choke collar that’s just right for your puppy. You’ll also get some tips on dos and don’ts. And then you won’t have to live with a puppy following in Uncle Joey’s footsteps.